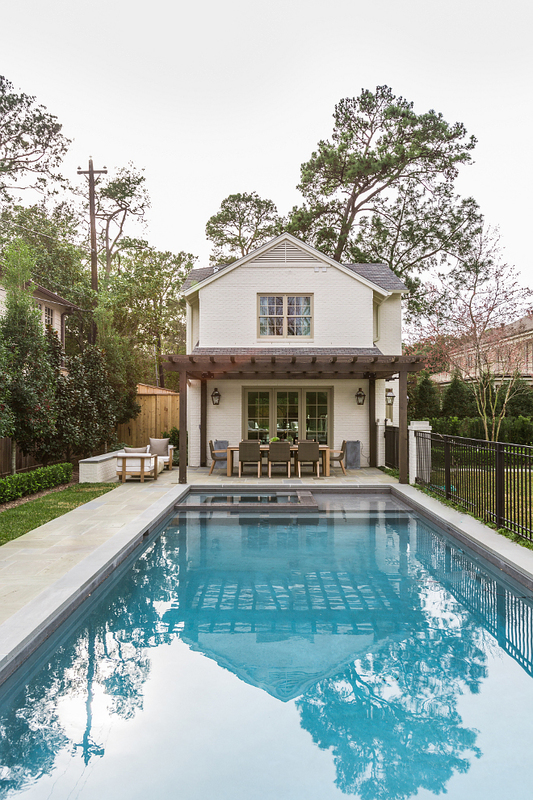 A Houston couple in the midst of remodeling their 1940s River Oaks home decided that guest quarters for visiting family and friends should be added to the back of the property. They requested that the guest space be constructed over a fully operational garage and were adamant that the structure share the same traditional River Oaks style they fell in love with. 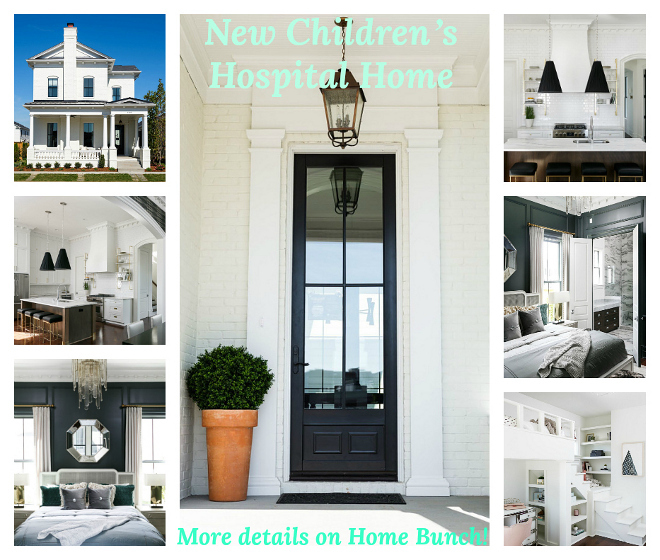 They enlisted the help of a local builder who made this new construction with classic style a reality, and a design team that ensured the interior details were flawlessly aligned with the details they treasured in their main home. 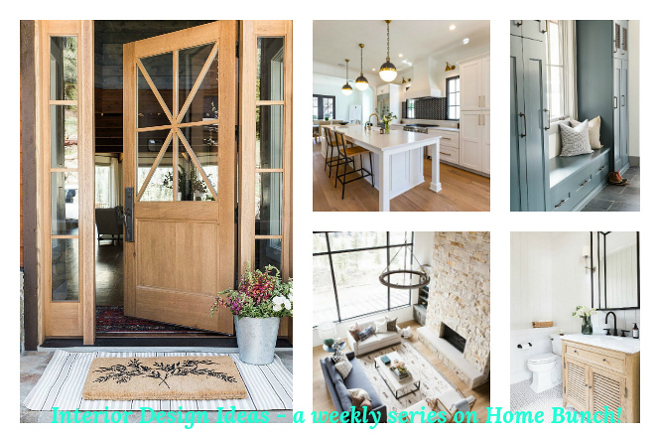 Modestly-sized spaces were fitted with interesting architectural details, a color story that remains soft with brief bursts of bold color, and tailored décor featuring bold textures and industrial accents. 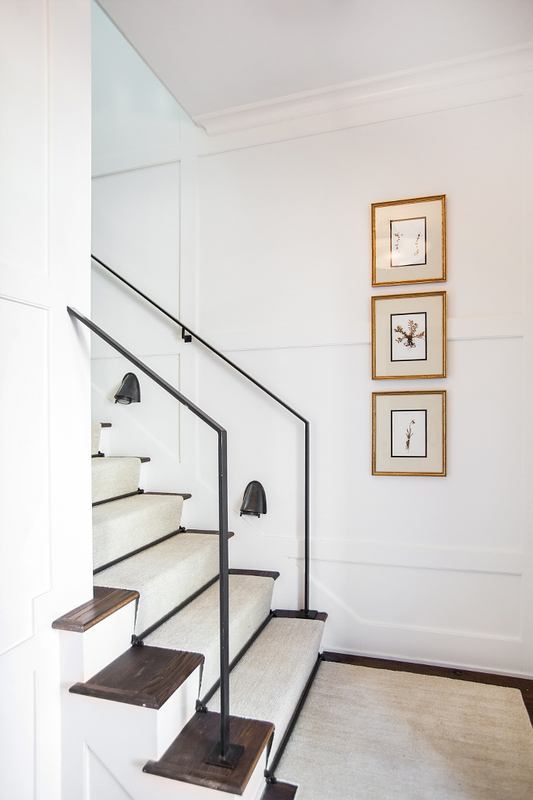 The entry features handsome grid paneling, integrated stairway downlighting and a sleek custom handrail, creating an inviting space that sets a well-edited tone for the rest of the spaces to come. 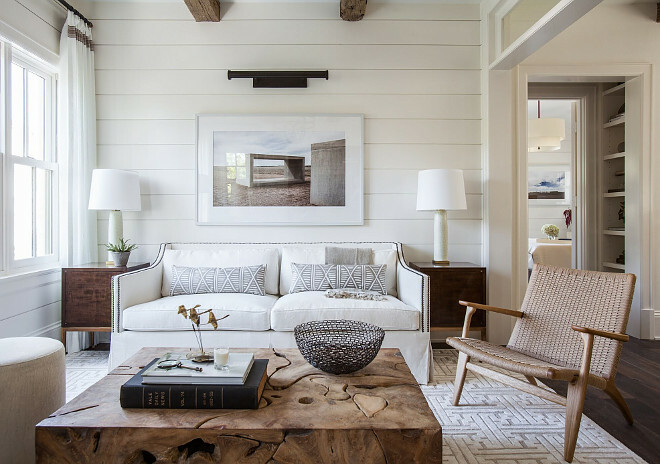 Once up the stairs, grid paneling gives way to shiplap paneling which is integrated throughout the majority of the living spaces. Superior functionality and lighting were essential to the success of the home’s design and these were achieved through the use of creatively hidden storage, multi-purpose furnishings and the addition of varying light forms. 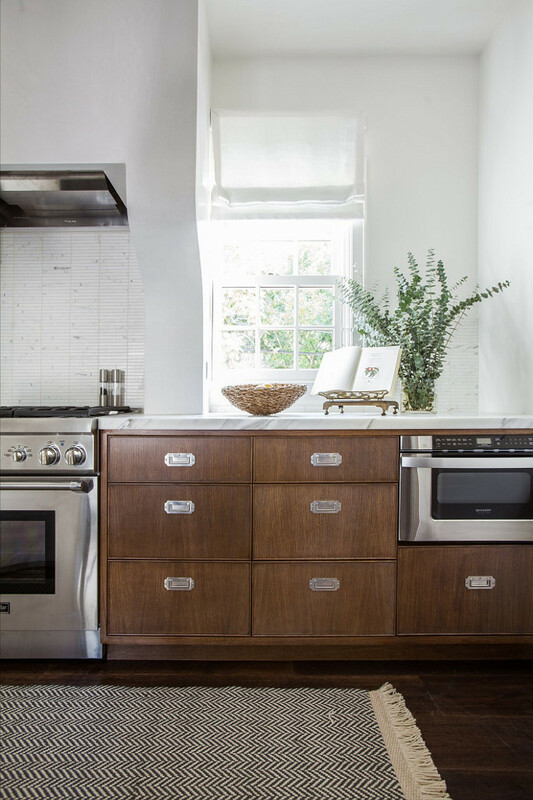 Paneled walls hide closets, cased openings and doorways were accented with shelves for storage and the kitchen table serves as both an island and the perfect spot for guests to dine. 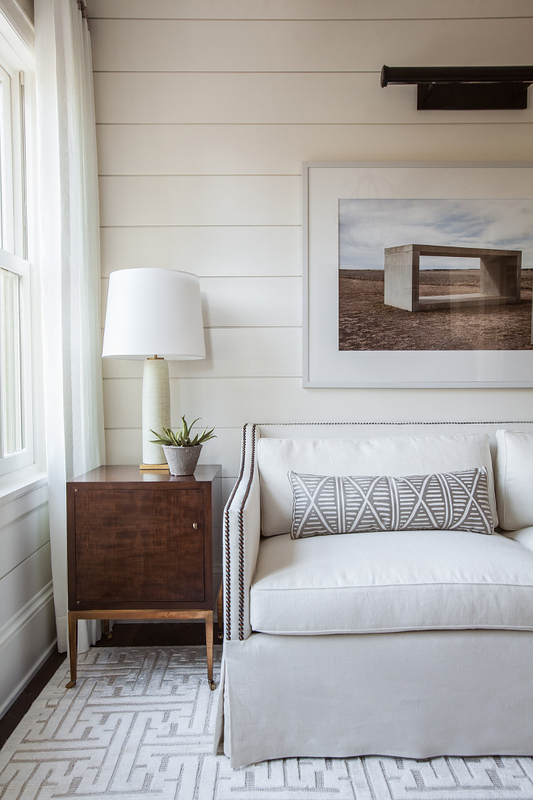 The home’s main windows were installed facing north and transom windows separate the living areas, allowing the home to embrace all the natural light Texas has to offer. 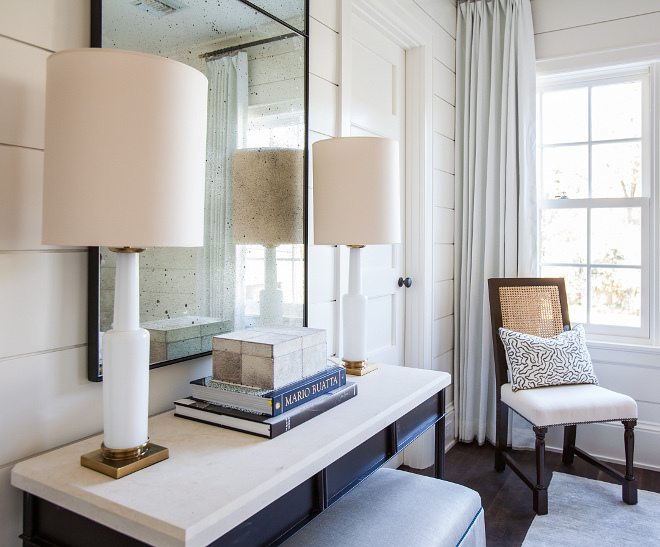 A generous mixture of lighting sources combines beautifully with the home’s architectural elements and furnishings, creating the perfect getaway for guests. 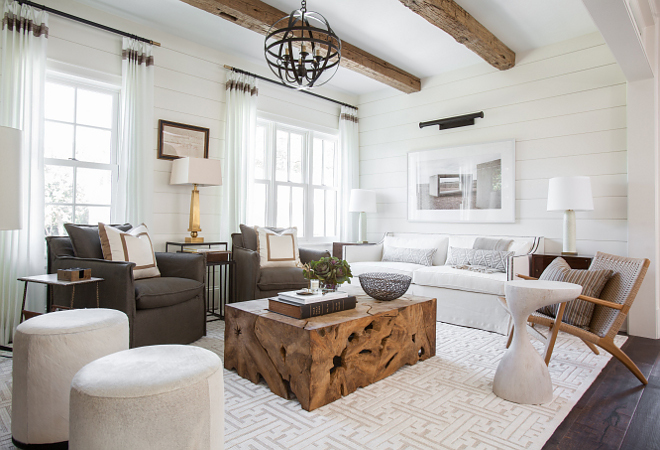 Interiors by Marie Flanigan Interiors. The exterior features off white Off White/cream brick, copper roof details and exterior copper lanterns. Pathway tile is natural Bluestone. Copper Lanterns – Charleston Series; Item#: CH-22, 13.5W x 23H x 14.5D – similar here and here. Planter can be found here. I would live in this guest house! Wouldn’t you?! 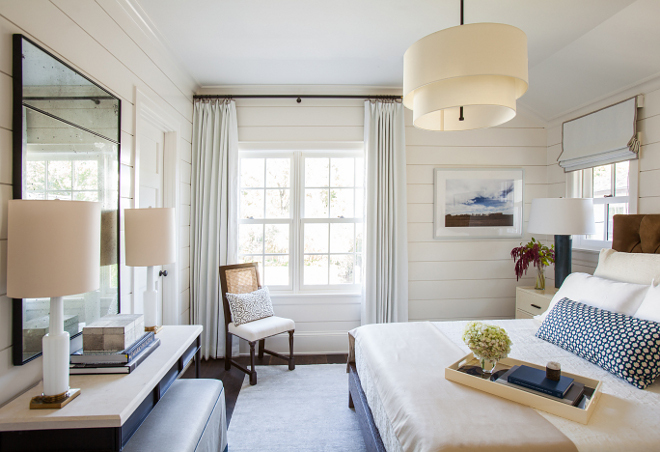 The paint color is Benjamin Moore Cloud White, which is one of the best whites by Benjamin Moore. Countertop is Calacatta Borghini Honed 2cm. 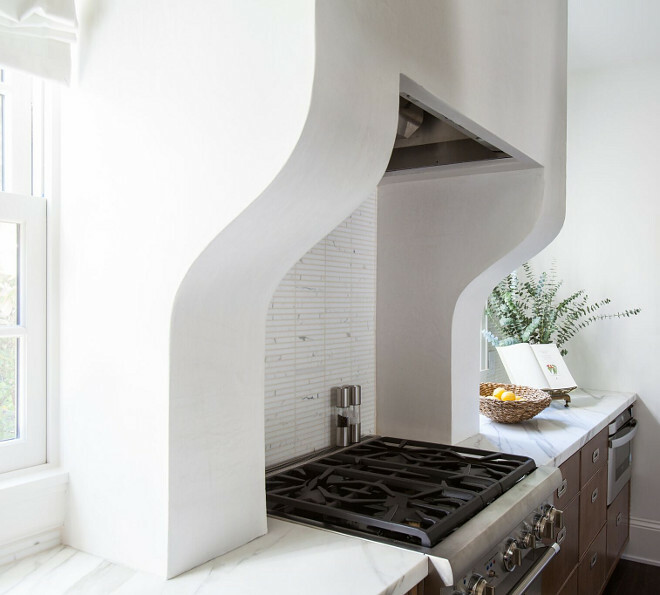 The kitchen features a white stucco hood, painted in Benjamin Moore Cloud White. Backsplash – 5/8″ x 6″ Stacked Calacatta Honed Mosaic, horizontal installation. Grout – Laticrete Item#: 18; Color: Sauterne. Lighting is Low Country Originals LCO – 096-04 Dark Bronze Pendant with Shade. 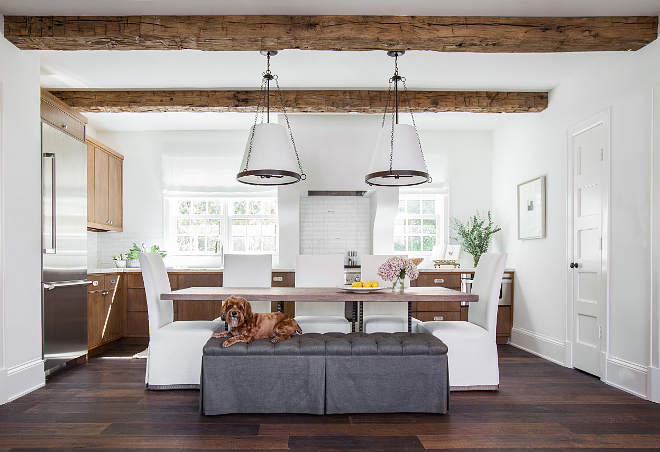 The kitchen table serves as both an island and the perfect spot for guests to dine. Dining Table: Custom crafted by Neal & Co using 2” Oak Top – similar here & here. 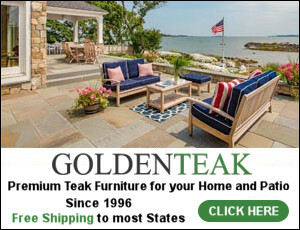 Chairs: Custom crafted by Neal & Co. Upholstered in Castel Linen Fabric – similar here & here. 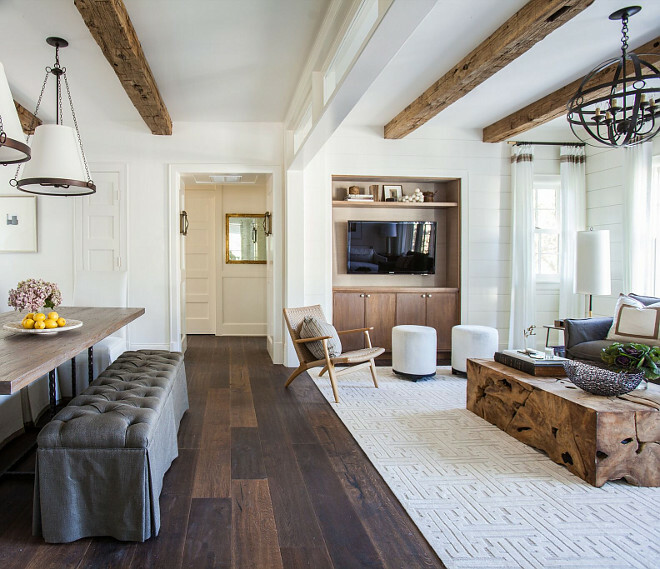 Wood flooring throughout: Summitt American Hickory – Piedmont Handsculpted – Kentucky Bourbon 7″ Wide and Features 7′ Maximum Plank – similar here & here. 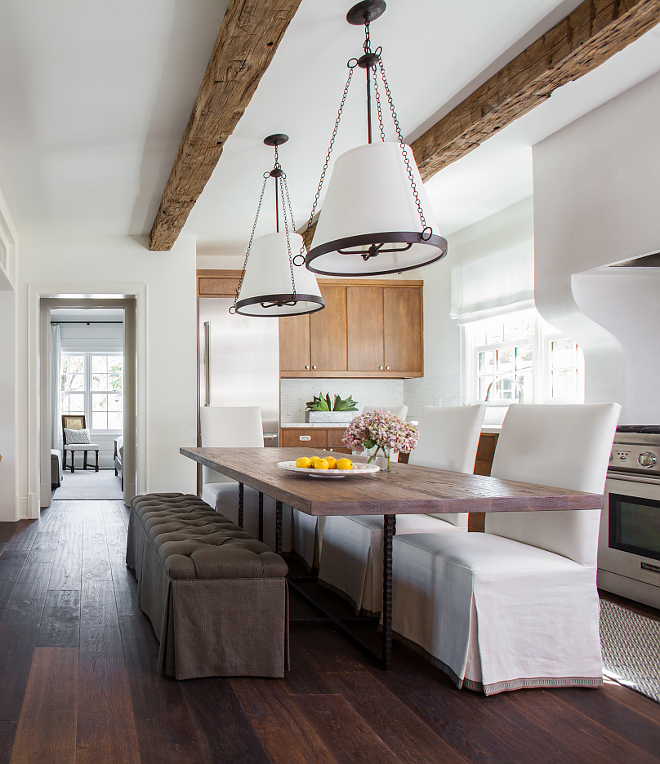 Kitchen features reclaimed ceiling beams from “Doros Flooring”. 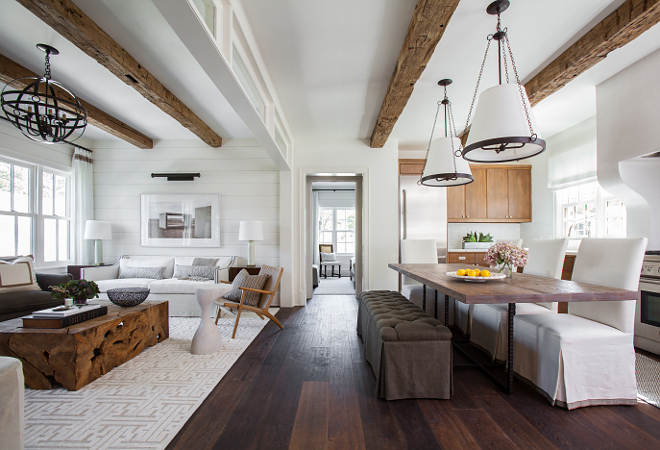 The kitchen opens to a living room with shiplap. Isn’t this place just gorgeous? It certainly doesn’t feel like a guest house. Floor Lamp: Visual Comfort ARN1001 Frankfort. 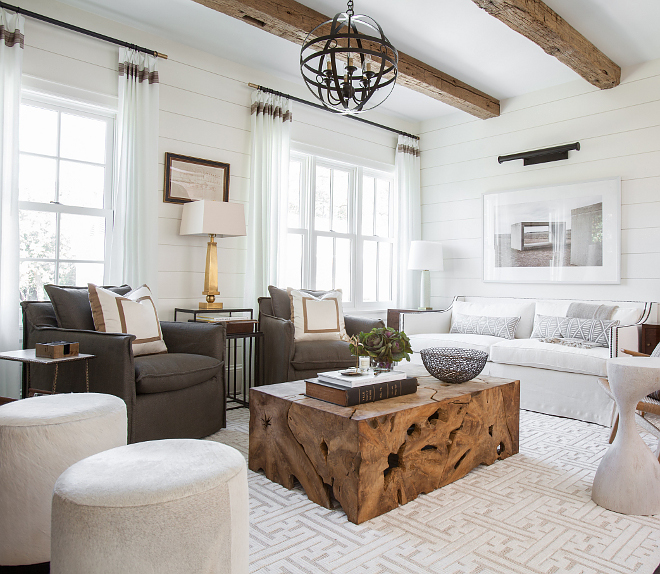 Shiplap paint color is Benjamin Moore Cloud White CC-40. This stunning sofa is Neal & Co. custom sofa with Castel Luxembourg II 100% Linen Fabric. Table Lamps: Dessin Fournir Laffan Table Lamp. Art: Annie Nyborg Marfa Photo. Lighting is Arteriors Hollace Chandelier. Club Chairs: Lee Industries C1897-01 Wesley Woodland, Haven. Magazine Rack: Interlude Home Strauss Magazine Table. The family room features a custom media cabinet. 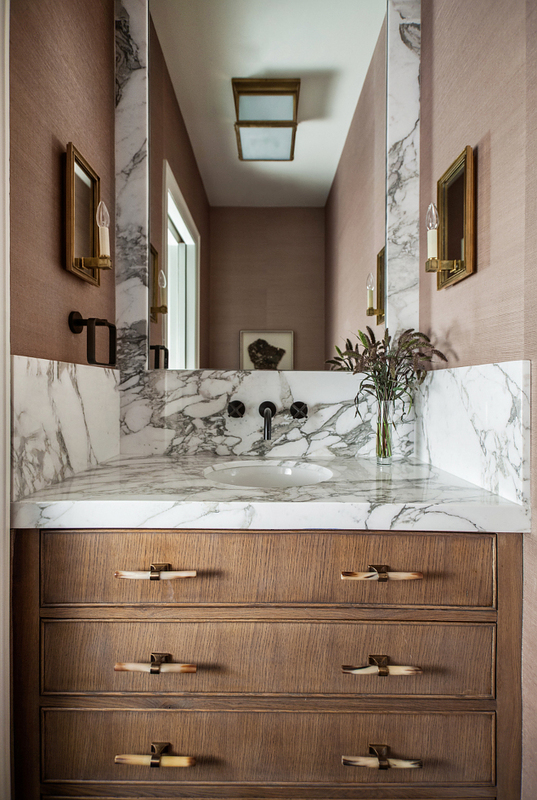 This gorgeous powder room features white marble countertop and marble framed mirror. What a fabulous idea! Marble is Carrara Marble Gold Honed. Wallpaper: Schumacher Haruki Sisal in driftwood colorway. Drawer Pulls: Ochre Pale Coloured Horn Handle. Towel Ring / Paper Holder – Series One Kallista in Gun Metal. Sink Faucet – Kallista Series One Wall Mounted Basin Faucet, 7 1/8″ Spout, Cross Handles – similar here. The entry features handsome grid paneling, integrated stairway downlighting and a sleek custom handrail. Light Fixture – Visual Comfort Charles Pendant – not shown. Stairwell Lights – Visual Comfort Grant Small Sconce. 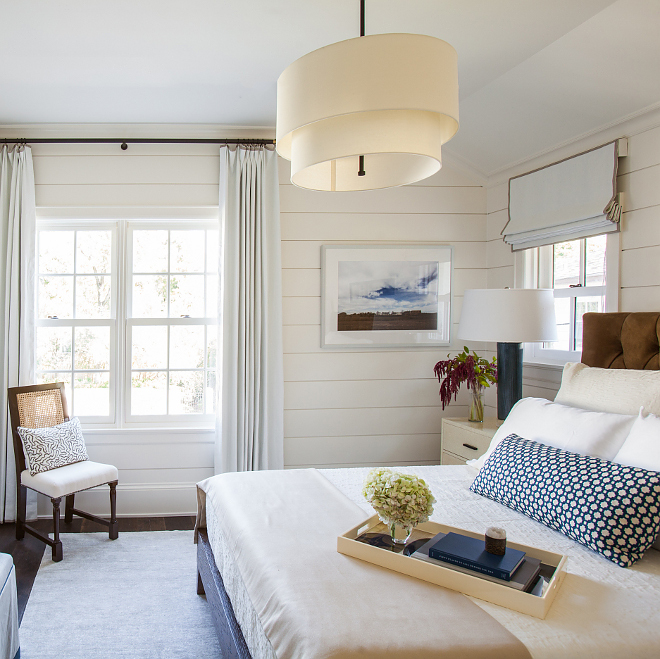 The bedroom features off-white shiplap and tailored decor. Lighting is Restoration Hardware – Large Two-Tier Round Shade Pendant Finish: Satin Nickel w/ White Linen Shade; Item#: 68060122 WLSN. Trim – Samuel & Sons Linen Woven Border in color 67 Natural Linen. Nightstand Lamps: Global Views Stria Ceramic Lamp. 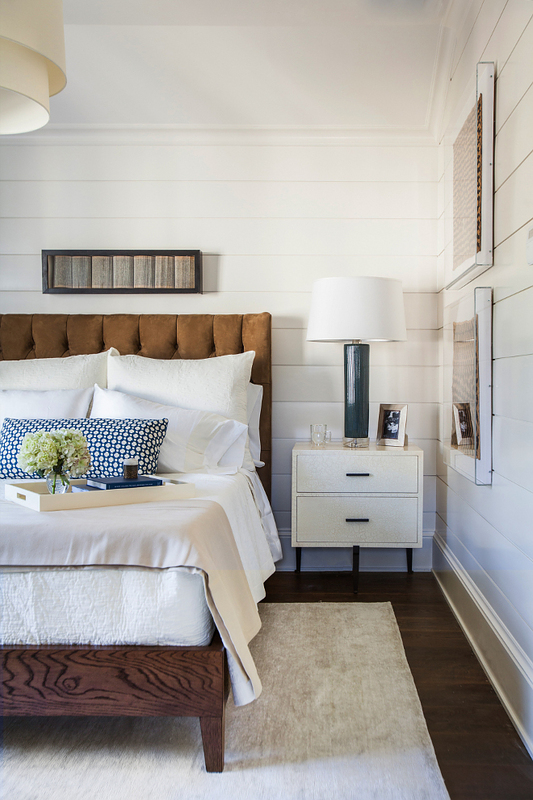 Headboard: Custom Made by Neal & Co. Artwork: Natural Curiosities Scalloped Books. Lamps on Console: Visual Comfort Small Fiona Table Lamp. 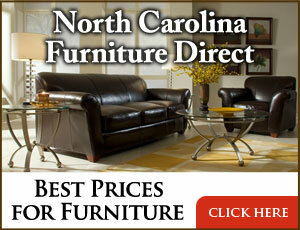 Accent Chair: Noir Distressed Brown Colonial Caning Chair. 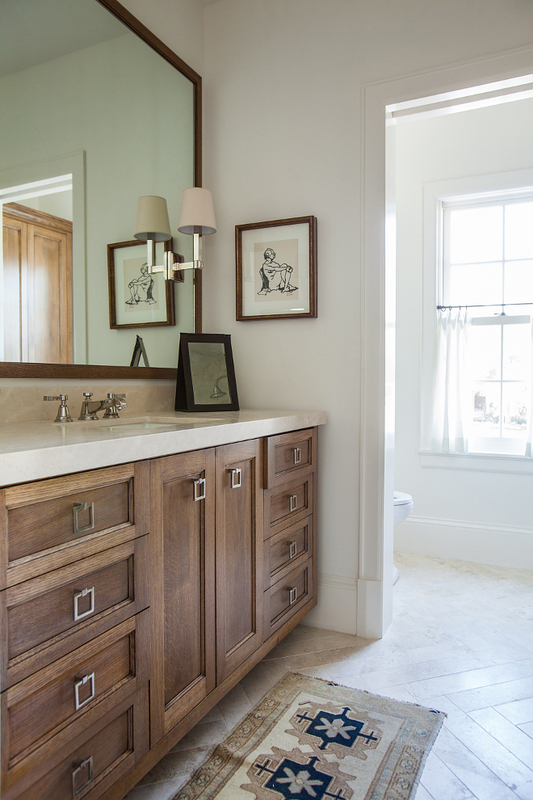 The master bathroom feels serene and calm. 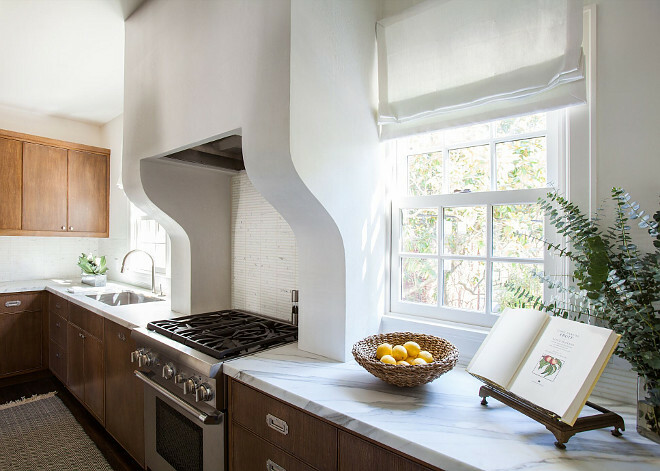 I am loving the cabinet pulls, the herringbone floor tile and the neutral countertop; Honed Vanilla Marble. Sconce Visual Comfort Single Square Tube Wall Light. Shower Fixtures: Kohler Pinstripe (not shown). 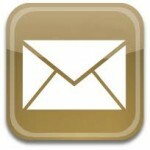 Floor Tile: Materials Marketing Herringbone Tile – Vintage 4″ x 24″ Planks; Honed – similar here. Similar Vintage Runner can be found here, here, here & here (larger). How beautiful is this place?! 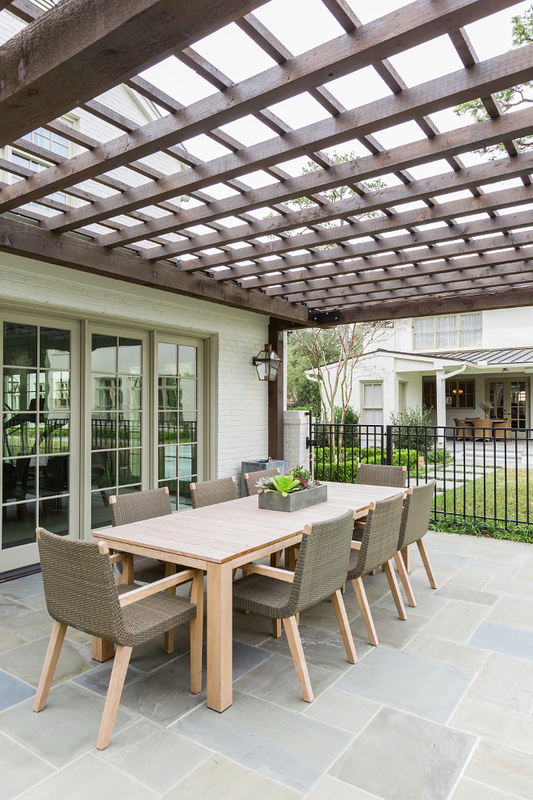 This pergola is perfect! 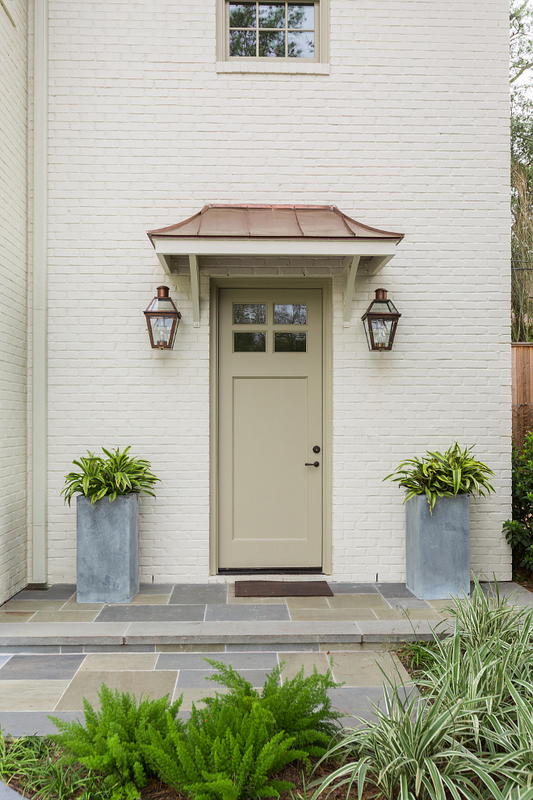 The patio floor tile is natural Bluestone and the outdoor dining chairs are Janus et Cie.
See more of Marie Flanigan Interiors on Home Bunch: Bungalow Renovation Ideas. 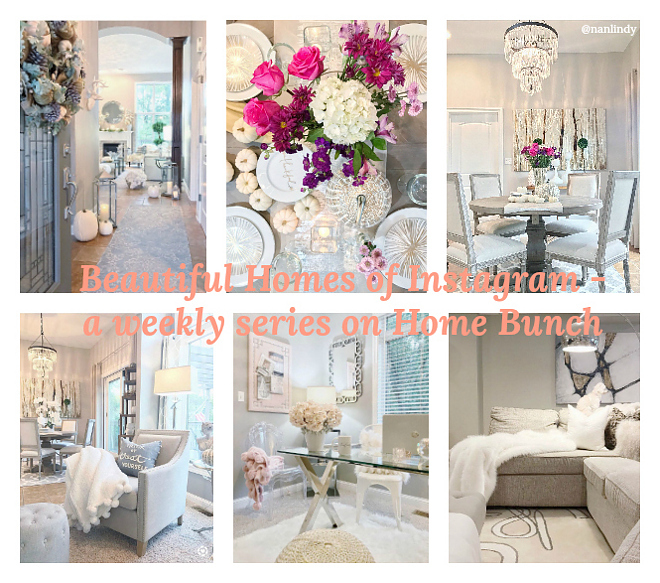 @nanlindy: Beautiful Homes of Instagram.